Incredible protection at the cost of just $30! 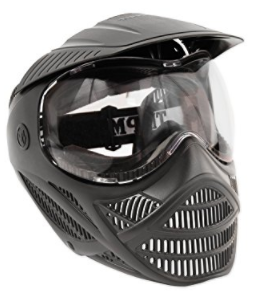 Buy the Tippmann Valor Starter Paintball Mask for an Incredible Price of just $30!, at Amazon, Now! Before we get into the review, let’s remember that this is a $30 mask. It isn’t meant to caress your head or give you a great “feel” when you wear it. It however does offer fantastic protection from pain, should you get hit on your face. There’s a reason why almost all paintball arenas across the USA use these masks as rental masks. It is because they can take a severe beating and have not much wear to show for it. There’s a lot of value buyers who like this mask because they can upgrade just the lens and have a pretty decently performing mask. There are some players out there that don’t really mind a mask that isn’t very comfortable to wear, as long as it will protect their face as they charge the field. Though at a low price point, this mask offers chin, jaw and ear protection like most masks can’t. There is ample protection. The foam layer is thin but just sufficient enough for you to tough it out there, without being very uncomfortable. Even at a very low price point, Tippmann have allowed you to change out lenses in a mere minute on this mask. That is quite respectable as other masks in this price range will give you lens change out systems that will take a good five minutes to carry out. If you are just starting out with Paintball or just need a mask that you will use very rarely, this will do the job. Even if you need something better down the road, this mask will give you a few more weeks of usage if you upgraded the lens, before you eventually want a comfortable, performance oriented full feature mask. Until then, the Valor is an incredible product costing just $30. Buy the cheap Tippmann Valor Starter Paintball Mask here.